Lots of Santa's Elf action around here these days. On my side, we do have some Gift Project Progress! 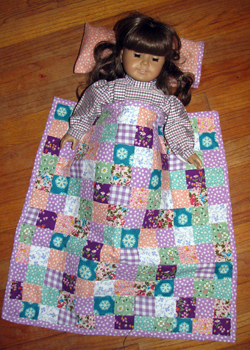 Belle's Doll Quilt–whew! My admiration for quilters grows by leaps. This little project took 144 squares which my mom meticulously cut and I pieced on my trusty machine. Just keeping track of the careful square placement and making sure that nothing got flipped sideways or turned around kept me wide-eyed. The reverse has purple-striped, soft flannel, and I used my little bias tape maker to iron up the polka-dot binding. The dark purple with flowers were scraps from something my mom made me as a toddler, and the multicolor floral from a dress I wore to my first (and only) piano recital. 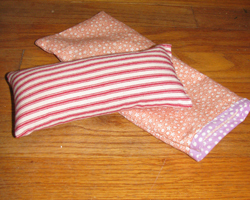 The pillow and case–my grandma provided the red ticking from her considerable stash. I still need to make the mattresses out of the rest, but two pillows are done. I hope she enjoys these–I remember loving all doll accoutrements with their cunning size and detail. 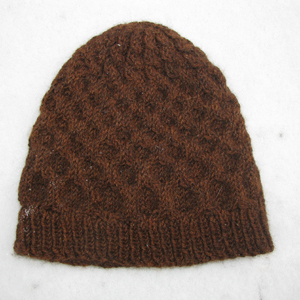 A Mad City Hat in Mad City snow–ready to warm up the head of a friend who chills easily. Yarn: Berocco Ultra Alpaca in brown. One sock, hung by the chimney with care. My first-ever sock! I've already got three inches of leg done on the second–I'm determined to give my mom socks for both her feet this year. I used a knitting pattern from Knitting Pure and Simple–the Beginner's Mid-weight sock. Most of the way through, I had a crisis of confidence. Progress seemed slow, and one night I woke up at four am, hungry. Those who know me won't be too surprised. After a snack, I sat down to knit the sock. The yarn (Koigu KPPM) felt ropy in my fingers and the shape of the sock looked awkward and misshapen. My mom would hate the sock. I'd spent all that money on fancy yarn and made an uncomfortable, monster garment. Was it too late to rip it all out and make something else with the yarn? Yes. Only the Xmas deadline stopped me from pulling out all of the stitches. I decided to try it on. I slipped the nearly-done sock over my foot. A dreamy smile must have come over my face, because my foot felt luscious. The sock softly hugged its contours and felt better than anything. So I finished it, and kudos to those pattern writers for coaxing me through. Okay, there's more, but we'll have to talk again later–it's just about time for school. I'll leave you with a little present–the Easiest Fudge Recipe Ever! Neither Belle nor Mike like real-sweet sweets-they'll both leave the frosting and eat the cake. So we came up with this dense, slightly chewy and rich variation on the traditional sugary fudge. Combine ingredients in medium saucepan over low-to-medium heat, stirring constantly, until chocolate melts. Pour into lightly-greased 8×8 baking pan, cover and cool in refrigerator until fudge is set. Maybe a half-hour. Take delight in offering this to all of your friends and neighbors who love fudge, and those who thought they didn't.